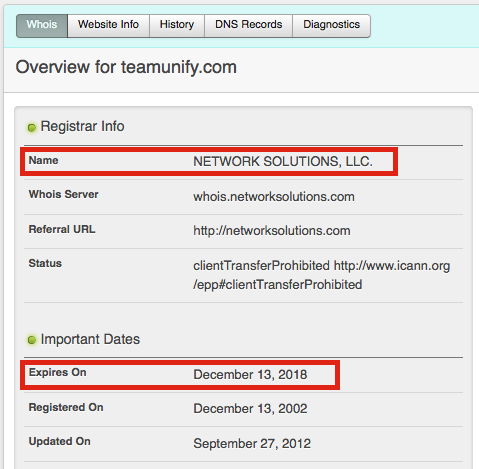 If you domain name has stopped directing to your TeamUnify site the most usual scenario is that it has expired and you need to pay your domain host to renew it. TeamUnify does not host domains; we only host your website and usually your zone file. If you go to http://who.is/ and type in your domain name, such as swimteam.com, it will list all known information. Most important will be the domain name company that is responsible and the expiration date of your domain. For example, this is the information for TeamUnify's domain. Once you contact your domain name host and pay to renew your domain name it will reconnect with your site. In the meantime you can always use our domain with your alias to access your site in the form of teamunify.com/teamalias. For example: http://www.teamunify.com/demo-c. If you don't know your alias please contact support@teamunify.com.